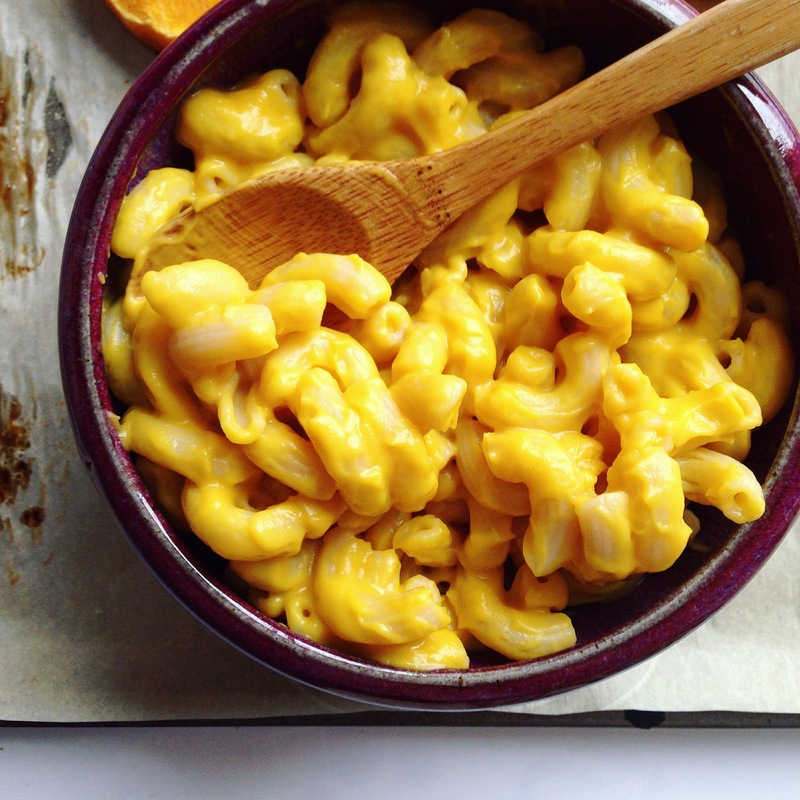 Three Ingredient Mac & Cheese. | Eat More Plants. I have made this more times than I can count in the past few weeks. You’d think I’d be sick of it after the fourth time this week…nope. Still going. That’s how much I love creamy bowls of cheesy pasta. I harvested all my winter squash – albeit a bit early – because I noticed some little critters snacking on a few of them. Sooo, now I have about 100 pounds of red kuri squash sitting on my laundry room floor in cardboard boxes (winter squash like to be cool and dry to keep their best texture and not get moldy – hence the laundry room locale). Red kuri has a flavor similar to pumpkin; mild, nutty and goes well with most anything. Bonus – the skin is nice and edible after roasting so no need to peel. I cut my red kuri in half, slice it into 3 inch chunks to cut down on the cooking time, and roast for about 1 hour at 400 degrees F. It’s done enough when it’s soft to the touch. You can make this recipe with any squash; I’ve made it with butternut and red kuri these past few times. 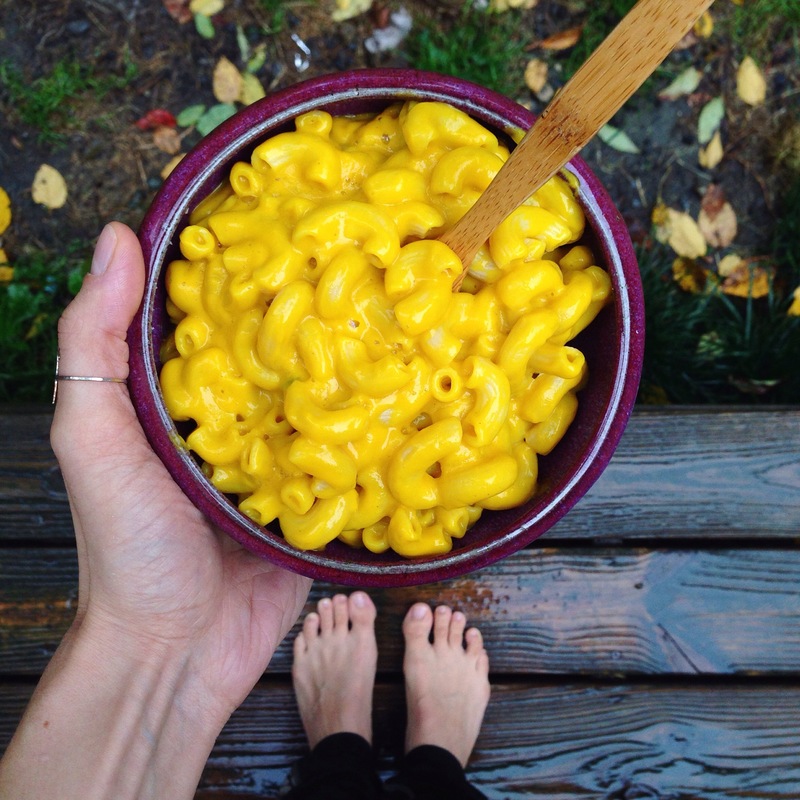 The nutritional yeast is what gives this a cheese flavor – I always end up adding a bit more when serving! I love my *nooch*. My 7 year old was hesitant about trying this [because ohhh squash?!] – until she took one bite and then it was head over heels in love. roasted squash – about 2 cups total, I know it’s difficult to measure the squash; a little more or less won’t hurt. I filled up a glass quart measuring cup with my squash pieces and it came a bit over the 2 cup mark. When your roasted squash is cool enough to handle, scrape the flesh out of the skin if using a squash like butternut or acorn or toss the pieces into the blender whole if using a squash with edible skin. Puh-LEEZE roast your squash. Roasting lends deep and luxurious flavors to your food, unlike steaming. If using an immersion blender in a pot, turn the heat to medium low while blending. Add more stock (or water) if it’s too thick to blend, a scant 1/4 c at a time. Blend until smooth, creamy and hot but not bubbling or boiling. If you’re using a high powered blender (like a vitamix) it should start to steam after 2 minutes of blending on high. Add nutritional yeast and mix well. Taste and add more nooch if needed, or a pinch of salt. Stir into a bowl of cooked pasta. Although I don’t think you need to add anything to this dish, I ate it with some sauteed swiss chard the other day and it was delish. Sauce will store for 4-5 days in the fridge. Makes approx. 3 cups. To reheat, warm gently over low heat on the stove. I like to add a little hot pasta water to it to thin it out if it’s too thick from sitting in the fridge. *if you are not vegan, or just not interested in nutritional yeast for your own reasons, feel free to substitute the nutritional yeast with another cheese.